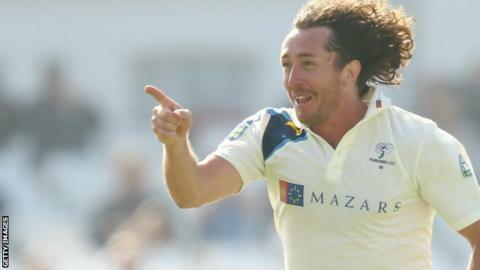 Yorkshire seam bowler Ryan Sidebottom has signed a new one-year deal with the county champions, tying him to the club until December 2016. The former England player has taken 663 first-class wickets, 48 of them last summer to help Yorkshire win the title. The 37-year-old left-armer told the club website: "To get to 700 wickets would be brilliant. "I am aware of that milestone and I would like to go beyond that figure. That's the challenge I've set myself." The Huddersfield-born bowler, who is in his second spell at Headingley after spending six years with Notts, took 79 wickets in 22 Tests for England at an average of just over 28, including a hat-trick against New Zealand at Hamilton in 2008. He also played 25 one-day internationals and 18 Twenty20 internationals for the national team. Sidebottom retired from international cricket in 2010, but remains a key member of Yorkshire's attack. "I enjoy coming in and playing with a great bunch of lads. We can do great things if we keep continuing in the same vain," he said. "It's about working hard for each other and to build on that team spirit and camaraderie and togetherness." Who made it into greatest ODI XI?